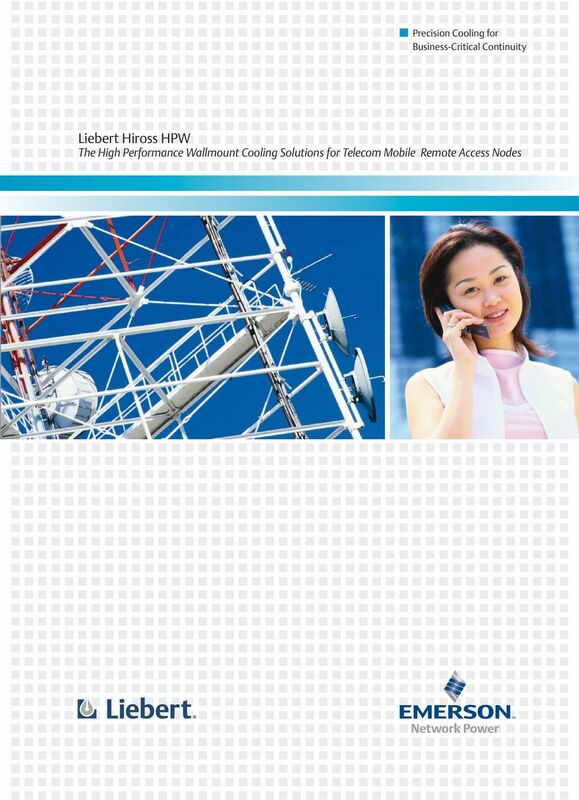 Download "Liebert Hiross HPW The High Performance Wallmount Cooling Solutions for Telecom Mobile Remote Access Nodes"
2 We re Emerson Network Power, backed by Emerson, a global company that brings technology and engineering together to provide innovative solutions for the benefit of our customers. We re the world leader in providing Business-Critical Continuity to organizations like yours, enabled by our product and service centres of expertise. Telecom Mobile Control System For wireless telecom applications, we provide control of remote access node environmental conditions. 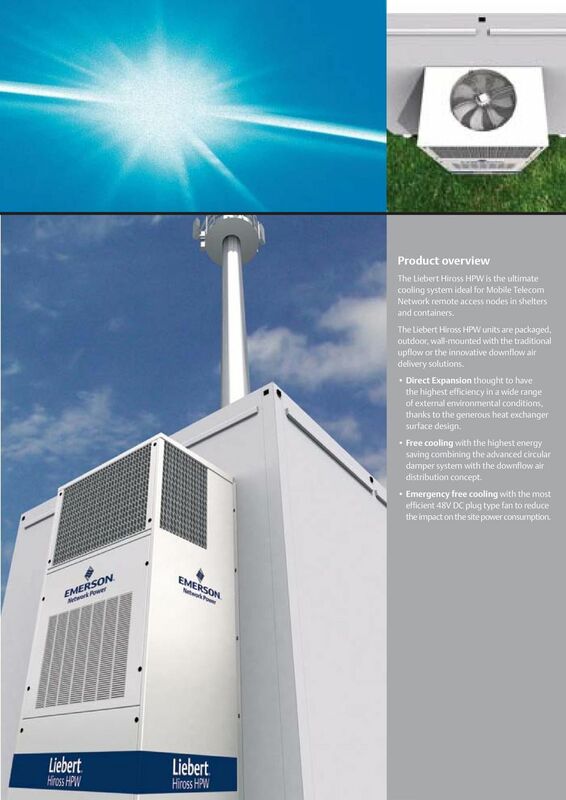 Our product portfolio includes a wide range of configurable solutions; outdoor packaged wall-mounting cooling system for shelters, when there s not enough space available inside the site; indoor packaged floor standing cooling system, to remotely reject, the heat generated by electronic equipment from IT rooms inside buildings; split system, to adapt the cooling solution to whatever site position, dimension and layout. 3 Product overview The Liebert Hiross HPW is the ultimate cooling system ideal for Mobile Telecom Network remote access nodes in shelters and containers. The Liebert Hiross HPW units are packaged, outdoor, wall-mounted with the traditional upflow or the innovative downflow air delivery solutions. Direct Expansion thought to have the highest efficiency in a wide range of external environmental conditions, thanks to the generous heat exchanger surface design. Free cooling with the highest energy saving combining the advanced circular damper system with the downflow air distribution concept. 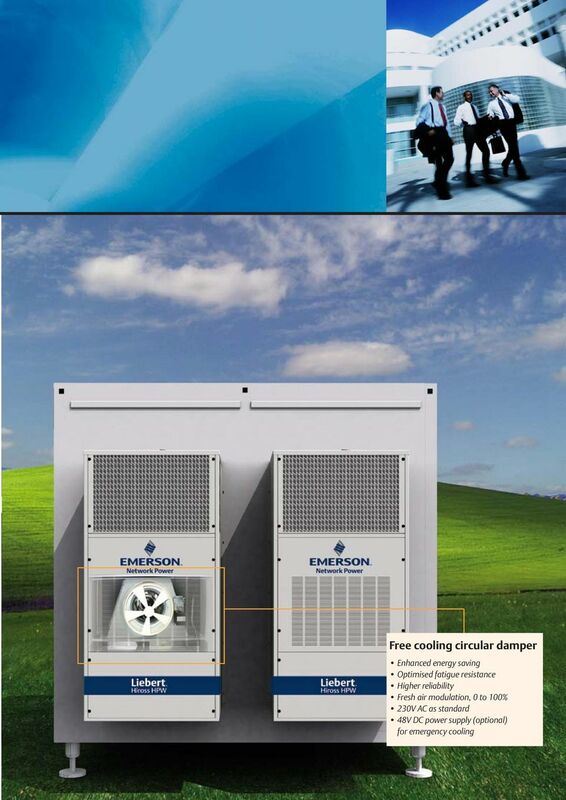 Emergency free cooling with the most efficient 48V DC plug type fan to reduce the impact on the site power consumption. 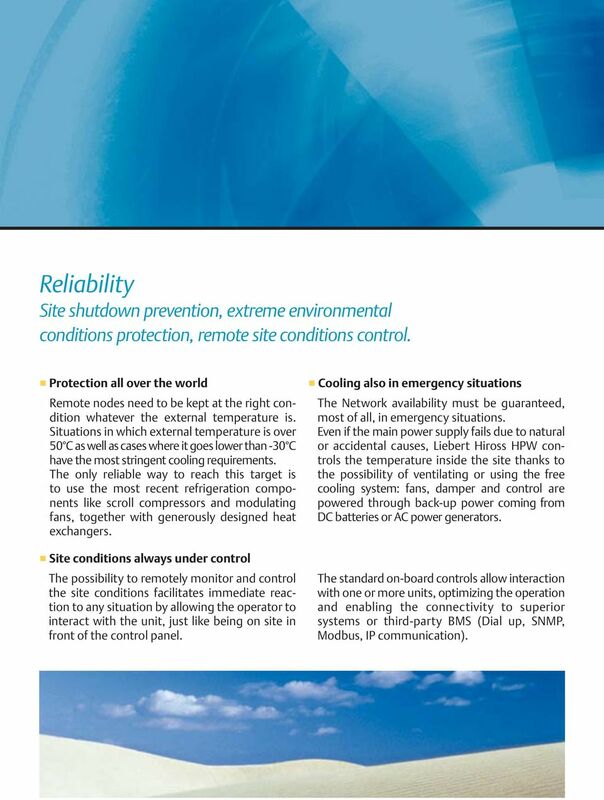 4 Reliability Site shutdown prevention, extreme environmental conditions protection, remote site conditions control. Protection all over the world Remote nodes need to be kept at the right condition whatever the external temperature is. Situations in which external temperature is over 50 C as well as cases where it goes lower than -30 C have the most stringent cooling requirements. The only reliable way to reach this target is to use the most recent refrigeration components like scroll compressors and modulating fans, together with generously designed heat exchangers. Site conditions always under control The possibility to remotely monitor and control the site conditions facilitates immediate reaction to any situation by allowing the operator to interact with the unit, just like being on site in front of the control panel. 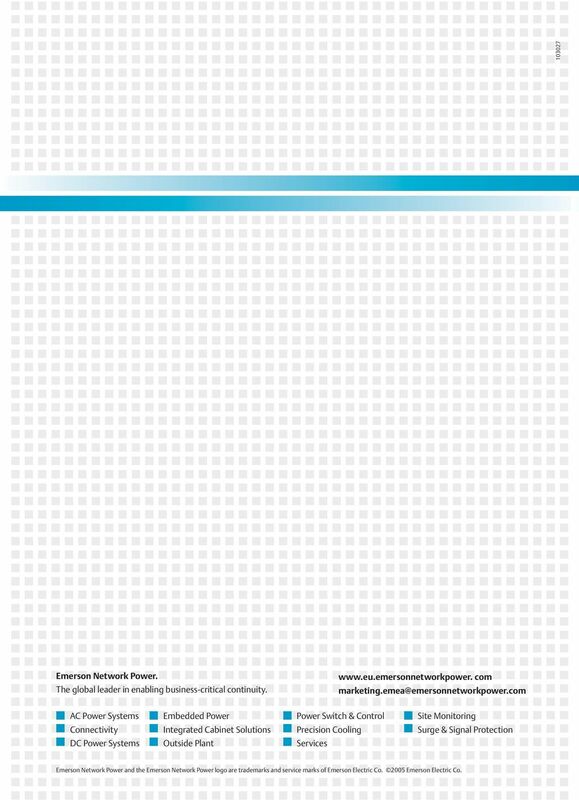 Cooling also in emergency situations The Network availability must be guaranteed, most of all, in emergency situations. 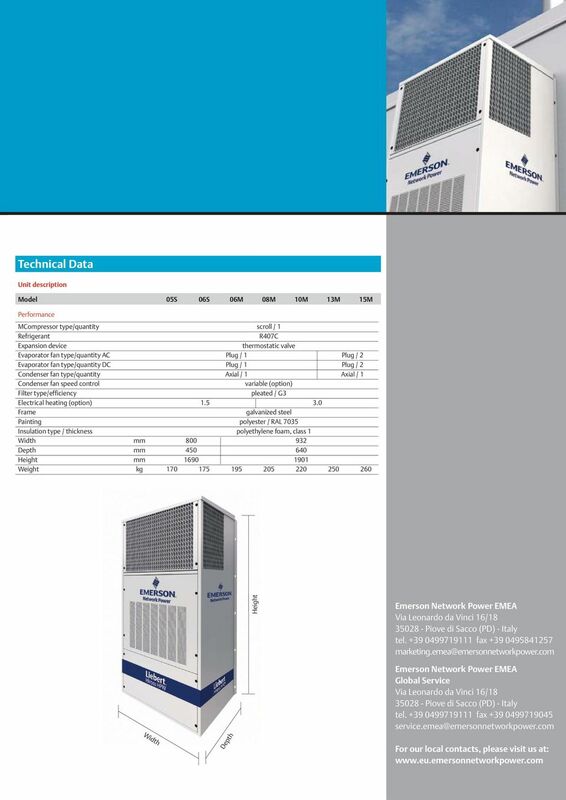 Even if the main power supply fails due to natural or accidental causes, Liebert Hiross HPW controls the temperature inside the site thanks to the possibility of ventilating or using the free cooling system: fans, damper and control are powered through back-up power coming from DC batteries or AC power generators. The standard on-board controls allow interaction with one or more units, optimizing the operation and enabling the connectivity to superior systems or third-party BMS (Dial up, SNMP, Modbus, IP communication). 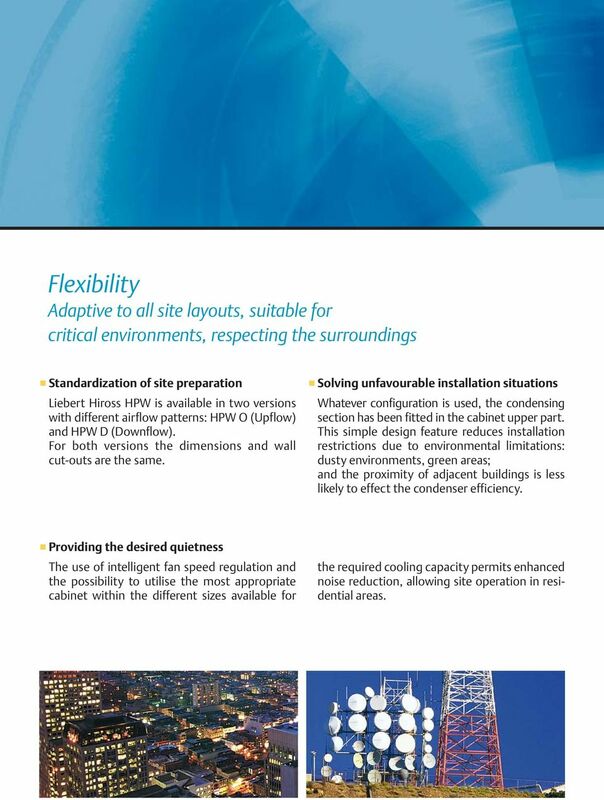 6 Flexibility Adaptive to all site layouts, suitable for critical environments, respecting the surroundings Standardization of site preparation Liebert Hiross HPW is available in two versions with different airflow patterns: HPW O (Upflow) and HPW D (Downflow). For both versions the dimensions and wall cut-outs are the same. Solving unfavourable installation situations Whatever configuration is used, the condensing section has been fitted in the cabinet upper part. This simple design feature reduces installation restrictions due to environmental limitations: dusty environments, green areas; and the proximity of adjacent buildings is less likely to effect the condenser efficiency. 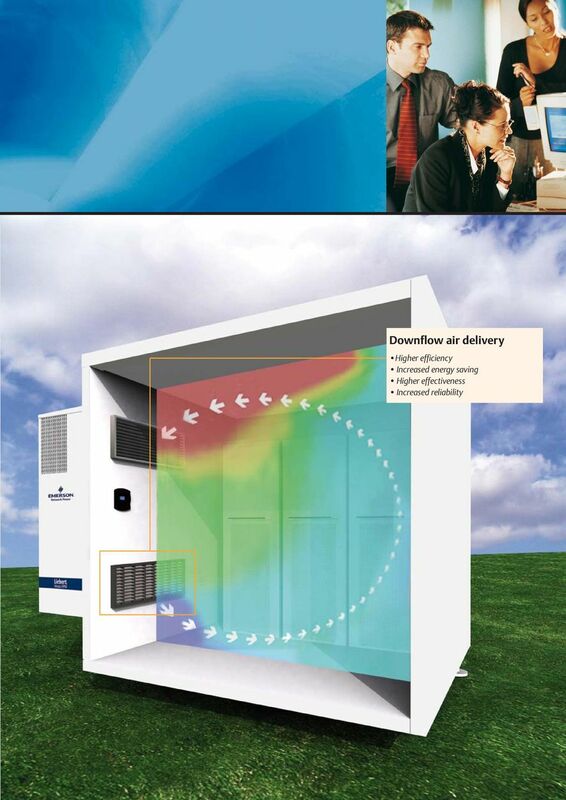 Providing the desired quietness The use of intelligent fan speed regulation and the possibility to utilise the most appropriate cabinet within the different sizes available for the required cooling capacity permits enhanced noise reduction, allowing site operation in residential areas. 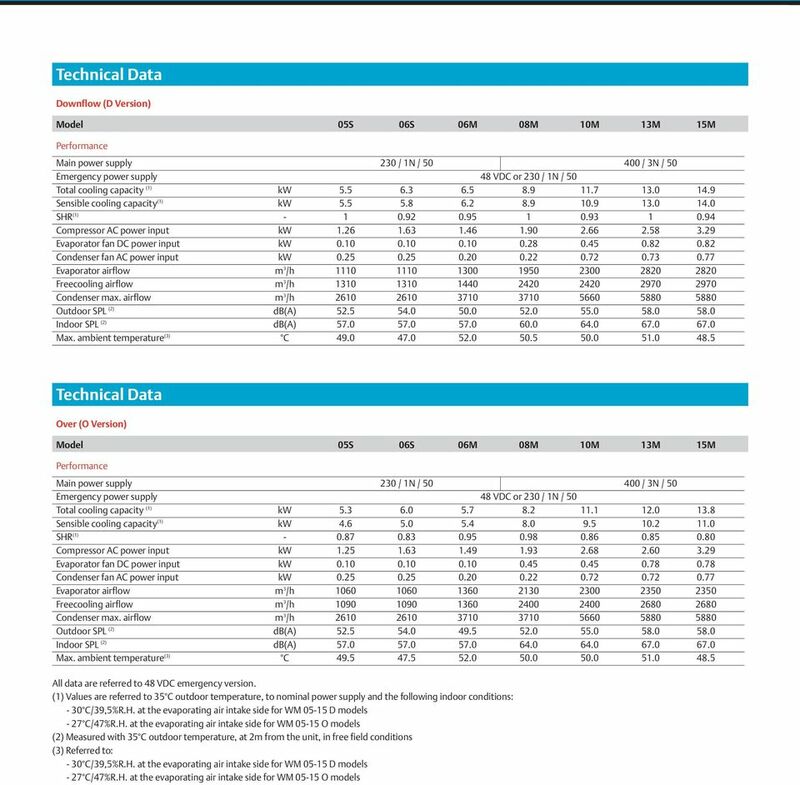 8 Total Cost of Ownership Target fast return on investment. Limited energy consumption The downflow air distribution produces unit Energy Efficiency Ratio values close to or higher than 3, even in critical environmental conditions (T higher than 40 C). 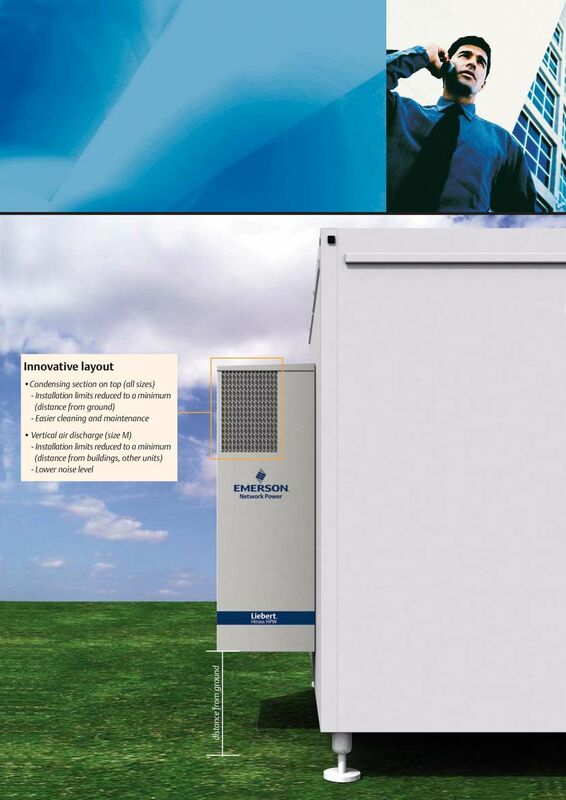 This, combined with the innovative free cooling system, can drastically reduce the yearly energy consumption. Avoiding inefficient cooling Cooling the electronics and not the site is what effectiveness can do, not efficiency. The possibility, thanks to the Liebert Hiross HPW downflow version, to provide cooling at the telecom equipment air intakes, reduces the typical inefficiency of indirect cooling systems. Reduced installation impact The cooling system is pre-charged and no pressure test is required on site. The installation is simplified thanks to the availability of pre-arranged air ducts (standard) and fast plug electrical connections (optional). Using the automatic commissioning software, installation and start-up can be completed in less than 25 min without the need for specialized personnel on site. 12 Emerson Network Power. The global leader in enabling business-critical continuity. 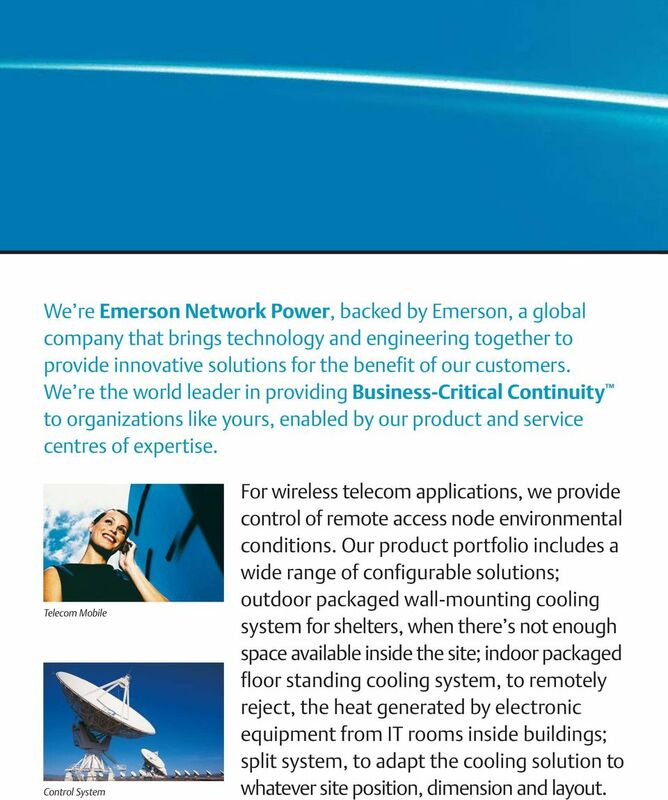 com AC Power Systems Connectivity DC Power Systems Embedded Power Integrated Cabinet Solutions Outside Plant Power Switch & Control Precision Cooling Services Site Monitoring Surge & Signal Protection Emerson Network Power and the Emerson Network Power logo are trademarks and service marks of Emerson Electric Co Emerson Electric Co. Single Room Heat Recovery Ventilation Advantages Conformity Installation Description Range Technical details Remote control Remote control Conformity electrical safety. Advantages Plug & Play installation. Technical Note: Using EC Plug Fans to Improve Energy Efficiency of Chilled Water Cooling Systems in Large Data Centers A Technical Note from the Experts in Business-Critical Continuity Introduction A U.S. In addition to the equipment heat load the room / enclosure will also provide heat gains through the building structure and environment.